Once a friend of mine asked me how my kid’s room is always tidy and things are always in place! I told her, when my daughter plays in her room she makes lots of mess but at the end, I ask her to keep her toys back in its place and obviously I also help her doing this. Some will say I always ask my kid to keep their toy back in place but they never listen. So the answer to this is – its all about making habits. Always telling them what to do never helps. Rather than words, children learn by what they see. For that, you have to be their role model. By this, I mean to say is that they will learn to keep things in place by you only. So, always show them how you are keeping the things you have used back to its place. Consequently, they will learn this habit from you and eventually start doing it on their own. 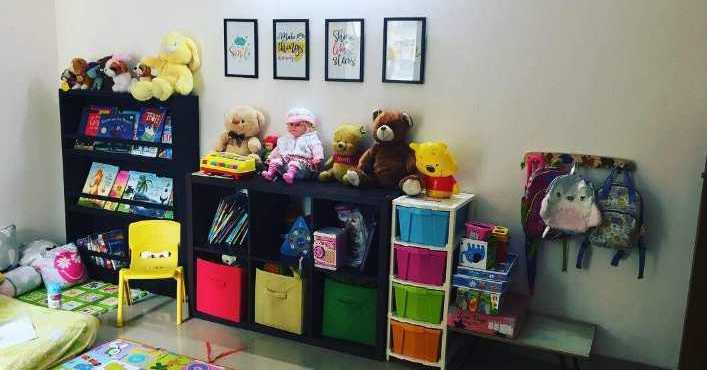 Here are some tips for organising your kid’s playroom and some storage ideas. Designate one single place to keep their toys. There should be a specific place for toys so that your kids know where to keep that toy back. Keeping toys randomly is not good. Invest in a bookshelf for keeping books in place or you can also make a DIY book storage by an empty cardboard box. For older kids, you can label the boxes in which the specific stuff has to be kept. Like crayons will go to that box or blocks will be kept in another. Designate a room as a play room and all the toys should be kept in that room only. It will help you in making your living room or bedroom mess free. I have also put a wooden hanger in her room of her height and she is supposed to hang her bags and umbrella on that hanger after coming back from school. In that way, her bags will not be lying here and there in the room. Cubical Storage box from @firscryindia.